A compilation of the most memorable space weather moments of 2016 can be found underneath. Using the fantastic (J)Helioviewer software, a ***MOVIE*** was created containing one or more clips of each event. 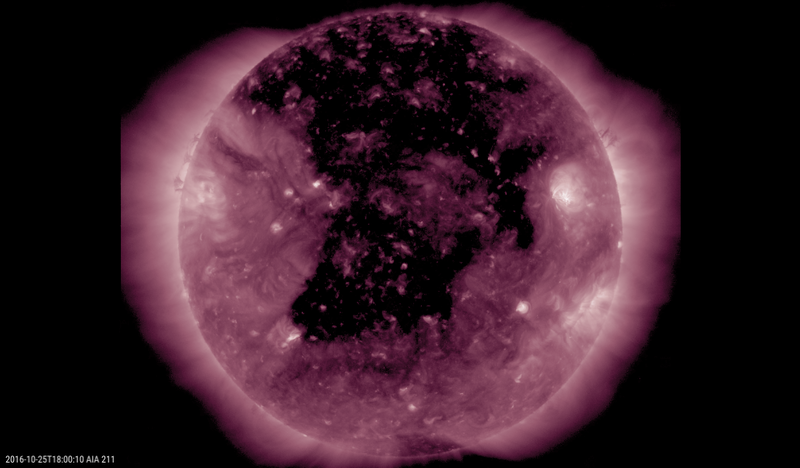 Usually, SDO-images were used, occasionally supplemented with imagery from PROBA2 and SOHO. As this chronological list concerns punctual events on the Sun, it does not contain clips from other noteworthy events in 2016, such as e.g. 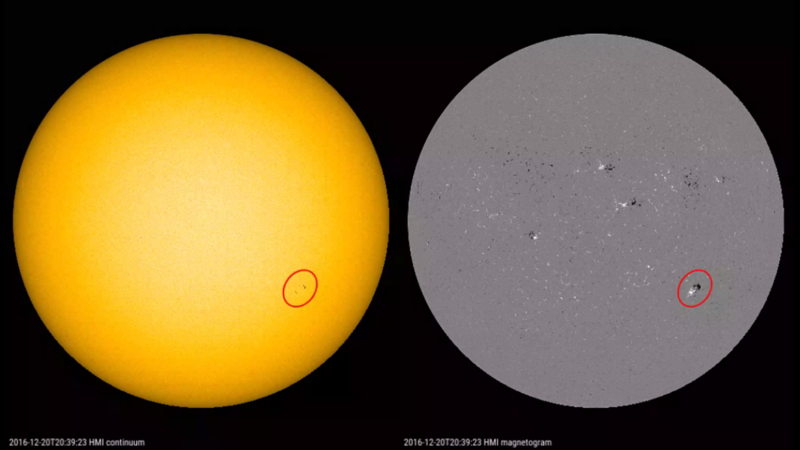 the Mercury transit (9 May), DSCOVR replacing ACE as the the prime real-time-solar-wind satellite (27 July) , or the 10th anniversary of the STEREO mission (26 October). A long duration M2.3 flare in NOAA 2473 was the source of the only proton event in 2016. It concerned a minor event, with the >= 10 MeV proton flux reaching only 21 pfu. The flare was accompanied by impressive and complex series of post-flare coronal loops (a so-called "arcade"). The associated coronal mass ejection (CME) had no obvious earth directed component, its bulk clearly directed away from the Sun-Earth line. The CME apparently missed Earth and certainly did not leave an obvious signature in the solar wind parameters. By far the largest sunspot group was NOAA 2529, which had a distinct heart shape and reached about 5 times the total surface area of the Earth. Several solar observers, using protective eclipse glasses, reported the sunspot group visible to the naked eye from 9 till 17 April. The region produced an M6 flare on 18 April and remained active well after it had started its farside transit. A relatively modest C3 flare near the small sunspot group NOAA 2542 turned out to be very impressive in imagery taken in the more energetic EUV (extreme ultraviolet) passbands. Lasting 2 hours and 14 minutes, it was also a long duration event. An enhancement in the energetic particle flux was observed, but the proton event threshold was not reached. There was also a partial halo associated with it, but not directed to Earth. From 25 June till 01 July, the year 2016 saw its longest string of spotless days. The increasing occurence of such days with no spots on the Sun indicates that that solar cycle is gradually moving towards its minimum. In total, there were 27 spotless days in 2016. 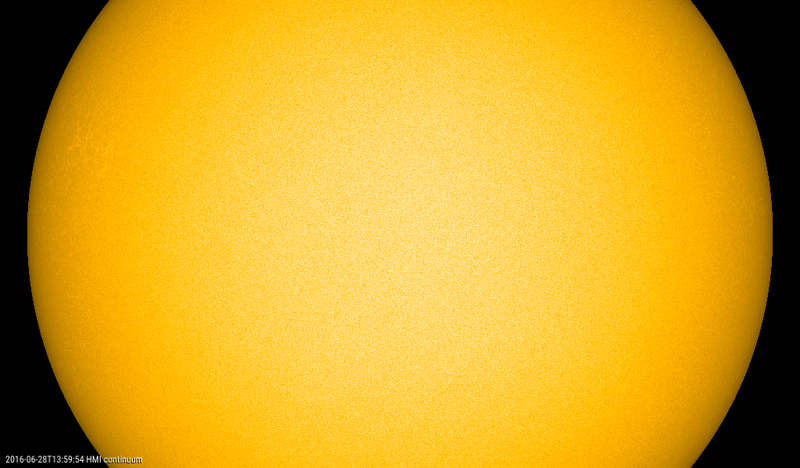 The number of spotless days during the solar cycle can be followed at SILSO's Spotless Days page. 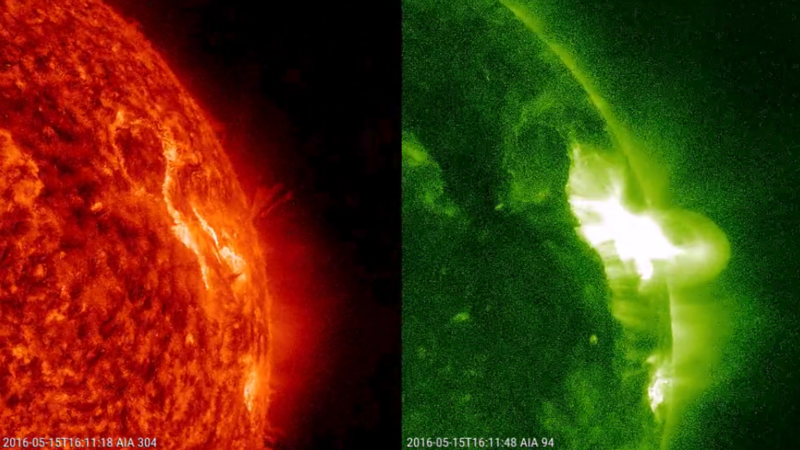 The most flare-active region in 2016 was NOAA 2567, producing the highest number of M-class flares (7) as well as the strongest flare: an M7.6 event almost immediately followed by a spectacular M5.5 flare on 23 July. NOAA 2497 and NOAA 2615 were the only other sunspot regions that managed to produce more than one medium flare in 2016 (resp. 3 and 2). During the year, a total of (only) 16 M-class flares and no X-class flare were recorded. Few impressive filament eruptions occurred on the Sun in 2016. 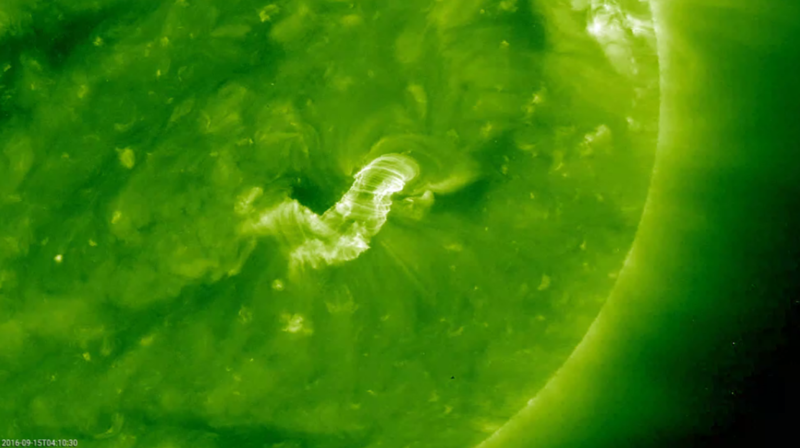 A strong eruption in old active region NOAA 2580 took place on the Sun's farside late on 14 September. 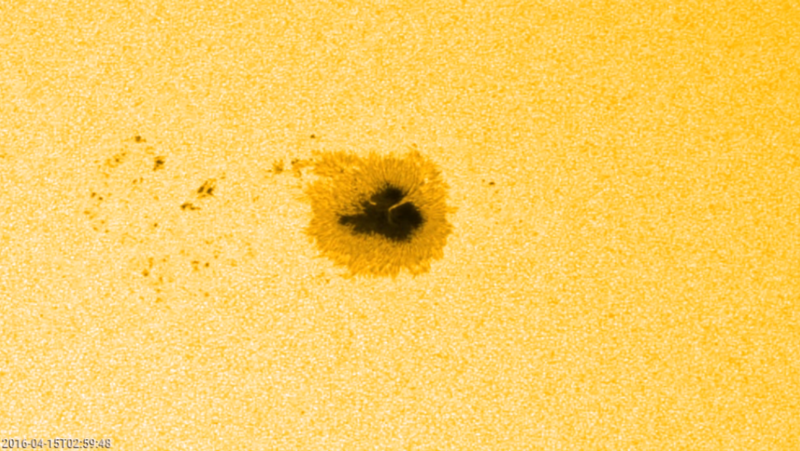 NOAA 2580 was a relatively simple sunspot region when it transited the solar disk from 22 August till 2 September, showing already a relatively important group filament visible in dedicated solar filters. 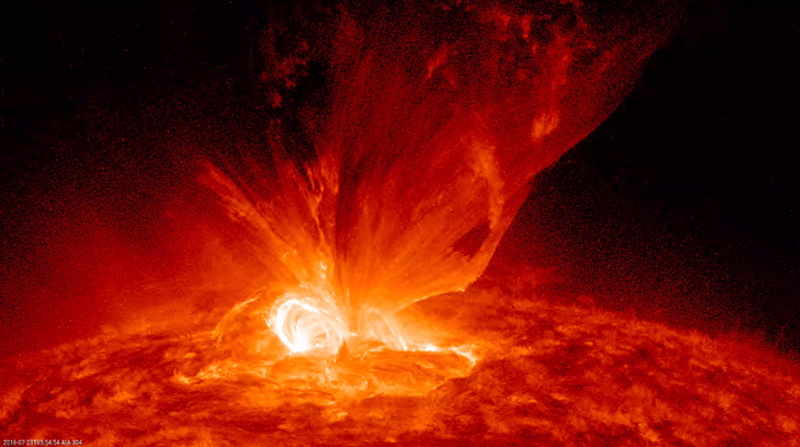 Just two weeks later, early on 1 October, a filament eruption took place on the earth-facing side. This filament had a respectable length of about 40 degrees, i.e. well over the average Earth-Moon distance. The feature was already visible during the previous solar rotation early September, when it transited the solar disk uneventfully. 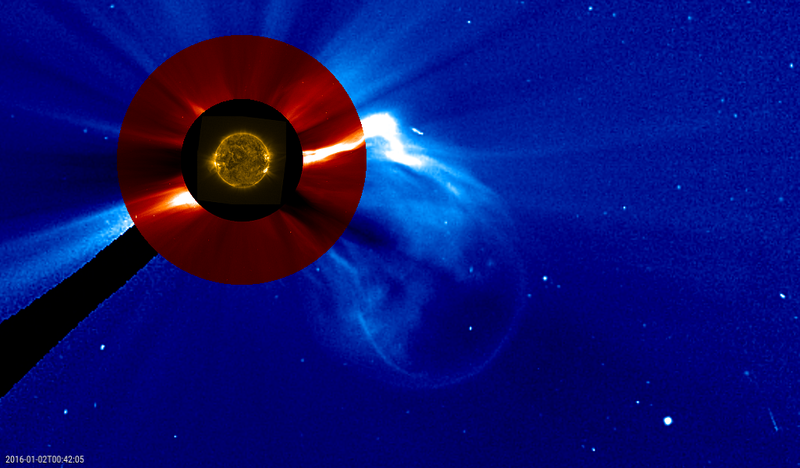 The associated coronal mass ejection was not directed to Earth. The geomagnetic field was not very often disturbed by CMEs. 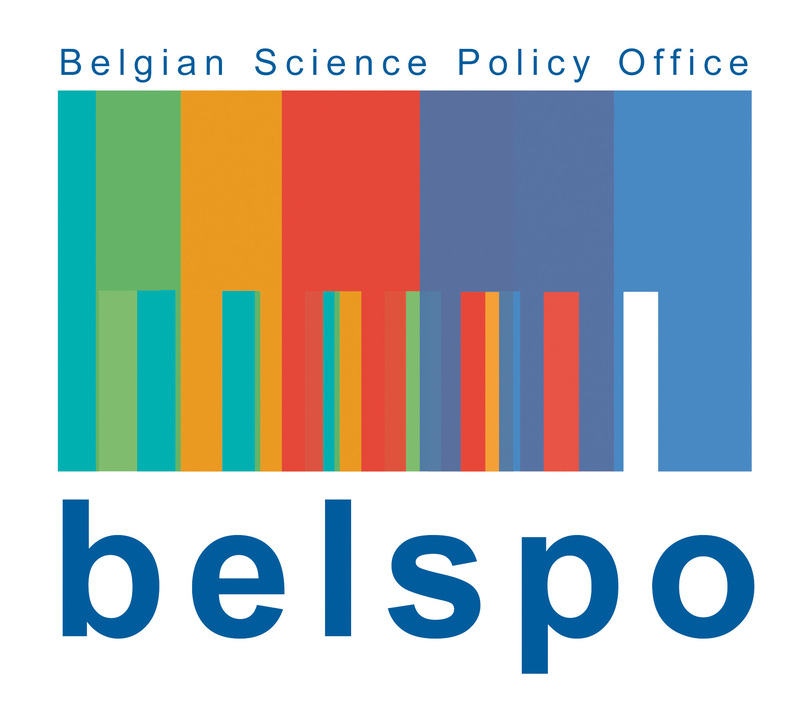 The most intense storms occurred on 1 January and 13-14 October, when the Dst index reached resp. -110 nT and -104 nT. These were the only two occasions that Dst dove beneath the -100 nT level in 2016. No severe geomagnetic storms were observed in 2016. In fact, the preliminary Kp index reached major storming levels (Kp = 7) on only 3 occasions: 6 March, 8-9 May, and 25-26 October. In all cases, the source of the disturbance was a high-speed stream (HSS) from a coronal hole (CH). Recurrent coronal holes determined the space weather throughout the year, which is typical at this stage of the solar cycle. The largest CH reached an area of about 800 times that of the surface area of the Earth during its transits in September and October. It had associated wind speeds near 800 km/s. Geostationary satellites recorded very high fluxes of energetic electrons (energies > 2 MeV), which are an important source of electrostatic charging effects inside satellites. Event 8: 20 December - First SC25 sunspot group? Aside the increasing number of spotless days and polar faculae, another sign of the gradually approaching solar minimum occurred on 20 December when what seems to be the first sunspot group of the new solar cycle (SC25) was observed at a latitude of -23°. This does not mean that the current SC24 has ended. Indeed, sunspot cycles usually overlap each other, occasionally up to 4 years. That's what's happening right now: Cycle 24 is heading down and simultaneously, cycle 25 gradually gains strength until it produces enough sunspots to take over from "old" cycle 24 and start a new solar cycle, expected around 2019-2020. Though NOAA 2620 is most likely the first group of the new cycle (reversed magnetic orientation, reasonably high latitude), its occurence at this stage of the solar cycle, with the expected cycle minimum at least 3 years away, would make it a very early apparition.